These days, top managers and business owners use a variety of strategic management tools. As known, it’s not easy to define strategic goals of the company since many factors (both internal and external) have to be taken into account. That’s why, some companies never managed to formulate strategic goals and perform actions to reach them. SWOT analysis is one of the methods used in strategic management. This is the acronym for strengths, weaknesses, opportunities and threats. In other words, company management looks at situation inside and outside the company, locates current and potential problems, makes an effective use of available opportunities for growth and development. AKS-LABS offers SWOT analysis guide for all those interested in this strategic management tool (business owners, top managers, strategic planners, budget and finance specialists etc.). This information package includes SWOT analysis templates, frequently asked questions, SWOT analysis guide. Such information will give answers to most burning and acute questions related to SWOT analysis. Besides, managers may use templates to make own SWOT metrics and have a look and what needs to be done to improve company position in the market. 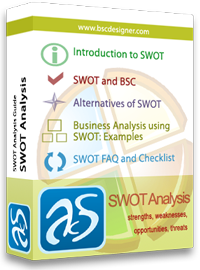 Get free SWOT analysis guide here, or purchase the full version of this package from this page.